Intel may have committed a CES 2014 fashion faux pas when it unveiled wearable technology prototypes that included rival ARM-based processors. Some of the company's reference designs were indeed powered by third-party parts, including its smartwatch concept, Intel spokesperson Bill Calder told TechRadar. Calder characterized the mixed-and-matched components as not a big deal since Intel has an ARM license and the smartwatch isn't an announced product. It's simply a prototype. He also denied previous reports that Jarvis, the company's unique voice-controlled Bluetooth headset, was being powered with ARM components at the convention. But the problem with demoing any wearable with a non-Intel processor remains. 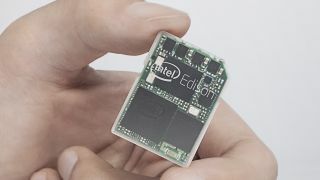 Edison, Intel's Quark-based chip, was concurrently being touted as an SD-card-sized solution for wearables. Unbeknownst to the CES audience, it's just not for all wearables seen on that same stage. At least it's all "Intel Inside" when it comes to Bay Trail Android tablets that the company said are due out in the second quarter of this year. Intel's Atom-based processor is already up-and-running in a number of Windows-based slates, but the Bay Trail chips powering the newer Google devices will be 64-bit, not 32-bit. Intel and other chip manufacturers have been in a race to catch up to Apple, which debuted the first mobile 64-bit processor in its iPhone 5S, iPad Air and iPad mini 2 with Retina display. Of course, like Apple's new hardware, Android users will have to wait for developers to start taking advantage of the superior Bay Trail specs before they really see a difference in performance.